Are the themes of the Aquarius New Moon. This new moon helps you have a bigger vision for yourself and the future. It helps you take the high road, and step into being a better person. The new moon takes place on February 15, 2018 at 4:05pm EST (1:05pm PST). It’s an intensified new moon because it’s also a partial solar eclipse. Are you ready to expand your vision for the future? Aquarius is supporting you. Aquarius inspires you to think more expansively. As an air sign, it’s highly creative, innovative, and revolutionary. Aquarius rules Uranus, the planet of revolution. It helps you think outside of the box. It demands equality. It inspires individuality. Do you have revolutionary ideas or new ways of doing things? Take note! This may be your best next step in bringing your super powers forward. Aquarius being the last air sign of the astrological year is thought provoking and expansive. Being in the present moment is so important with Aquarius. Make time and space to contemplate and follow your ideas. It’s the sign of independence, and going your own way. It’s time to let your originality be seen. There’s no need to follow the crowd, Aquarius pushes you to think originally and get your original material out into the world. As an air sign, Aquarius reminds you to open up space for new ideas and information. What area of life does Aquarius affect you? Pull your astrology birth chart and see which house it is influencing. This new moon is going to be powerful and helps you reflect on your super powers. It helps you understand your strengths and unique gifts that you’re here to share with the world. Aquarius rules communicating your message on a deeper and more meaningful level. It helps you bring your unique signature to the world as you share your knowledge and wisdom. With the partial solar eclipse, the moon will pass between the earth and sun, blocking the suns rays from reaching earth. This may bring in higher intelligence and a higher order of your life. The suns rays will be partially blocked when the moon passes between the sun and earth with the Aquarius New Moon. This event presents a rare opportunity to see what still needs to be cleaned up from your past. The Solar Eclipse impacts the South Node of the Moon, which relates to releasing past emotional wounds, ties to the old story, letting go of outdated patterns and beliefs, releasing limiting thoughts, resolving karmic ties, releasing family patterns, and letting go of past life issue. Understanding which house this falls in for you will be beneficial in helping you focus on that area of your life. The Solar Eclipse helps you see where you still need to let go so you can begin to move forward. There is an echo affecting the same axis we experienced with the Leo Solar Eclipse last August. What themes were taking place in your life then? What has shifted in the past six months? This will give you insight into recurring patterns that once you’re aware of, you can make conscious shifts in changing. Need help with the Aquarius New Moon? Reviewing your astrology birth chart can be overwhelming. There are so many details! Do you want some help in seeing where this new moon is affecting you? Get a Mini New Moon reading. What do you have to let go to move forward in a new beginning? Jupiter is supporting you in seeing the bigger picture, seeing yourself as being bigger or better than you’ve been. Which house is Jupiter in for you? This will help emphasize your luck. The Chinese New Year takes place right after the Aquarius New Moon. This is the year of the Earth Dog. The dog energy is loyal, determined, easily makes and keeps friends. It works hard, and appreciates the luxuries in life. It is giving and generous. Which of these characteristics will you embrace this year? The “earth” aspect of the year reminds you to stay grounded. It also implies there may be events taking place related to real estate, land, agriculture, earthquakes, and other earth related activities. With the Aquarius energy it’s a good time to take up small habits that have a big impact on the environment and cleaning up the earth. The strong earth influence this year is reflected in the I Ching hexagram – Mountain over Mountain. The mountain is stable and anchored. The Mountain also obstructs your vision. Metaphorically, what is hidden from your view? Asking this question will help you see blind spots that limit your ability to manifest what you want. Listen to repeating messages from others to help you move beyond them. Aquarius is associated with the pineal gland and part of the third eye. It helps you in processing information you receive from your Divine power. This supports your spiritual connection and awakening. It is enhanced through following your intuition. The pineal gland produces melatonin, a hormone that affects the wake/sleep patterns and seasonal patterns. Imbalances in this chakra may show up as headaches, dizziness, foggy thinking, vision issues, sinus issues, nervousness, sleep patterns, lack of inspiration, perceptiveness, and intuition. Meditation, spending time in nature, using essential oils, practicing yoga, or prayer, and practicing these mantras can help restore balance within the pineal gland. Each new moon provides us with an opportunity to go inward and explore what wants to be known or expressed through you. 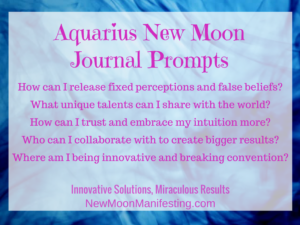 Since the Aquarius new moon relates to expressing your unique gifts and wisdom this is a great time to meditate and write about these journal prompts. As a result of entertaining these thoughts, your soul may inspired to take action in an unexpected way, or support you in finding your tribe or like minded people. Expressing your thoughts in written form is such a powerful tool to organize your thoughts and clarify emotions that are coming up. Essential oils support you physically, emotionally, and spiritually. They naturally work with you body’s chemistry to restore balance, helping you shift perspectives and dissolve old patterns and programming. The Aquarius New Moon theme relates to breaking free from the past patterns and beliefs so you see the truth and live from your inner light. Frankincense is my favorite oils to help you understand your truth. With it’s grounding energy, you may feel more willing to question the status quo and what you’re being told. You may be willing to dig a bit deeper to validate your inner promptings. And as a result you may develop a deeper connection with your intuition and following this guidance. What’s right for others isn’t always what is right for you! What other essential oils are you drawn to with the Aquarius New Moon? Let’s discuss them and other questions you may have about essential oils in our Good Vibe Oil Tribe essential oil call. It takes place right after the Aquarius New Moon call. Since Aquarius is an air sign you may be inspired or bombarded with ideas. You may have bursts of insight, innovation, or inspiration that guide and direct you. How can you implement those ideas into your community? This new moon will support you putting into practice what you believe will support the greater good. There will be a strong desire to speak up and express your ideas. So make your voice and ideas heard. When each of us shares our ideas we bring about change that supports us all. With the Aquarius New Moon, let your originality shine and follow your Divine blueprint. You may be surprised at the inspiration that comes through this powerful New Moon/Solar Eclipse.